Before you can add any mapped domains to WordPress, you need to install the WordPress MU Domain Mapping plugin to help handle this in WordPress. The Domain Mapping plugin doesn’t do any setup on the server side; it helps rename the site and takes care of any login issues. Unzip the plugin on your local computer. Inside are two php files: domain-mapping.php and sunrise.php. Open your FTP program and navigate to your website’s wp-content folder. Upload the sunrise.php file directly into the /wp-content folder. 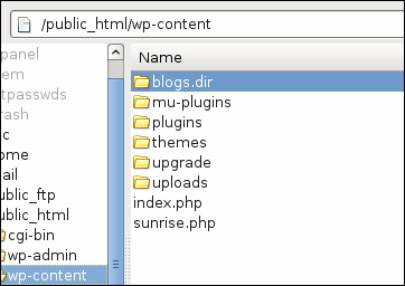 Inside the /wp-content, look for a folder called /mu-plugins. If there isn’t one, use your FTP program to create this folder. Upload the domain-mapping.php file into the /mu-plugins folder. The figure shows how these files look on the server. From here, you need to add a line to your wp-config.php file. Download a copy of your wp-config.php file by using your FTP program. Open wp-config.php on your computer with a text editor and add the following line under the define( ‘MULTISITE’, true ); line. Save the file and upload it to your website. The plugin is immediately available (and running) on your network. All you need to do is set up the options and map a domain to a site. Two new items are added to the Super Admin menu: Domain Mapping and Domains. On the user administrator side, a new Domain Mapping item appears on the Tools menu. The network admin needs to activate domain mapping on the Domain Mapping page (Network Admin→Domain Mapping) before a user can map a domain by enabling the Domain Mapping feature.